The votes are in, and it's official: the new "winery to watch" is Dusted Valley Vintners, owned by two newcomers to Walla Walla. Dusted Valley was anointed by a media and trade panel in advance of the annual WAVE (Washington Arriving Vintner’s Event) held last weekend in Benton City. Dusted Valley’s story is a familiar one: a lifelong love of wine, a dream of owning a winery, and seizing the opportunity to turn the dream into reality. What's different here is that the players are two brothers-in-law, Corey Braunel and Chad Johnson, who married sisters from Wisconsin’s dairyland. Having discovered over a ten-year period that they also shared a love of wine (as well as a professional background in related medical fields), they found themselves in Walla Walla over Memorial Day weekend in 2003. “It was as if we’d been struck by lightning,” recalls Corey, 30. “By Labor Day, we’d packed up and moved the family from Madison to eastern Washington.” Chad, 34, didn’t have quite as far to travel; he already lived in Vancouver. They originally hired Steve Lessard of Whitman Cellars to make their first vintage of 1,000 cases, all from purchased fruit. In 2004, Lessard became a consultant; Corey and Chad are co-winemakers. The Dusted Valley Vintners 2004 “Old Vines” Chardonnay was also singled out by consumers at the WAVE tasting. Hand picked and whole cluster pressed, then barrel-fermented in neutral French oak, the wine did not undergo a secondary malolactic fermentation, thus retaining fruit flavors, racy acidity and natural balance. 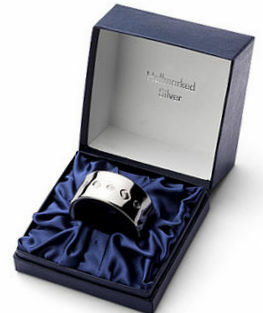 A total of 400 cases were produced; retail price is $20. “It’s a dream come true,” Corey said of the WAVE award. Nineteen new wineries—in their first or second vintage—participated in this year’s event, which was held at the Hedges Cellars Family Estate on Red Mountain. 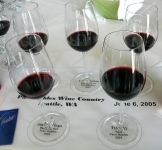 Trade and media representatives had a preview of the 2005 event but the result of the voting wasn't announced until after the WAVE tasting. Cornichon, having been out of town, out on the town in Chicago, as it happens, missed the tasting. Just found out about all this. Cute story, no? Like Fort Bragg, Belltown was decked out for the Presidential pep talk, but my Happy Hour glass is half-empty and filled with bile. 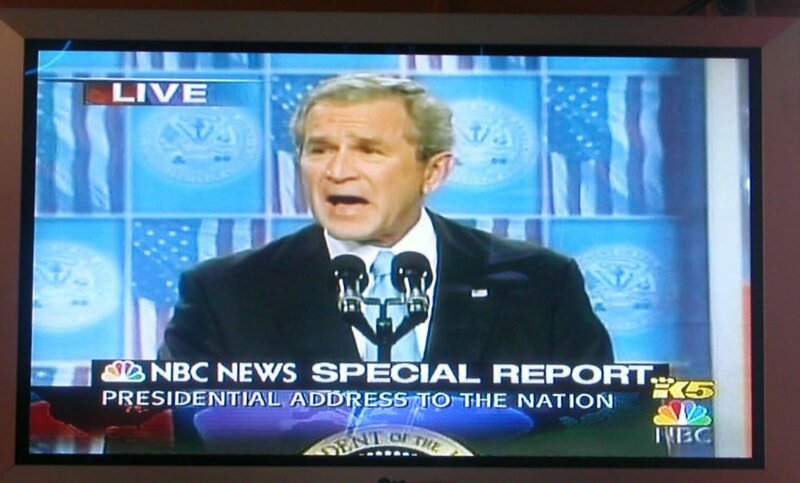 Iraq as the crucible of 9/11 terrorism? No greater calling than military service? Our would-be Recruiter-in-Chief seems incapable of an argument devoid of moral obfuscation. 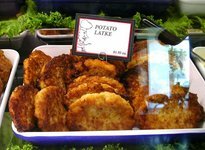 Doused with salsa, smothered in cheese, soothed with sour cream or redolent of curry, the glib words from the screen can't disguise the taste of rotten meat. Got news for you, George: it's not just our enemies who believe that American society is decadent. Kyeong Han, the owner of Belltown's Wild Fish, is making good on his promise to deliver "creative, contemporary" Asian food. Best example of Han's unorthodox approach is his Dim Sum lunch. Literally translated as "touch your heart," traditional Cantonese dim sum are steamed dumplings, served two or three to a plate from a cart pushed through the dining room. 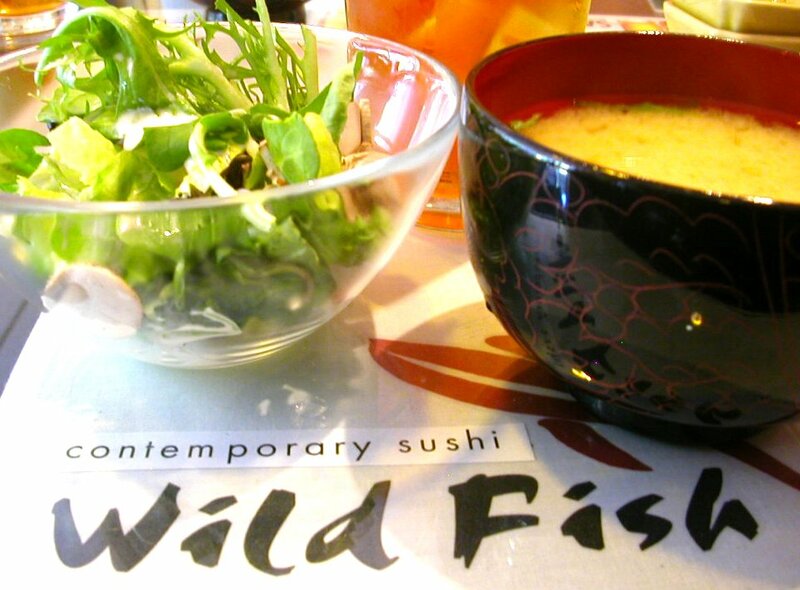 But at Wild Fish, it's something else entirely: an Asian version of the hot Seattle trend of "small plates." 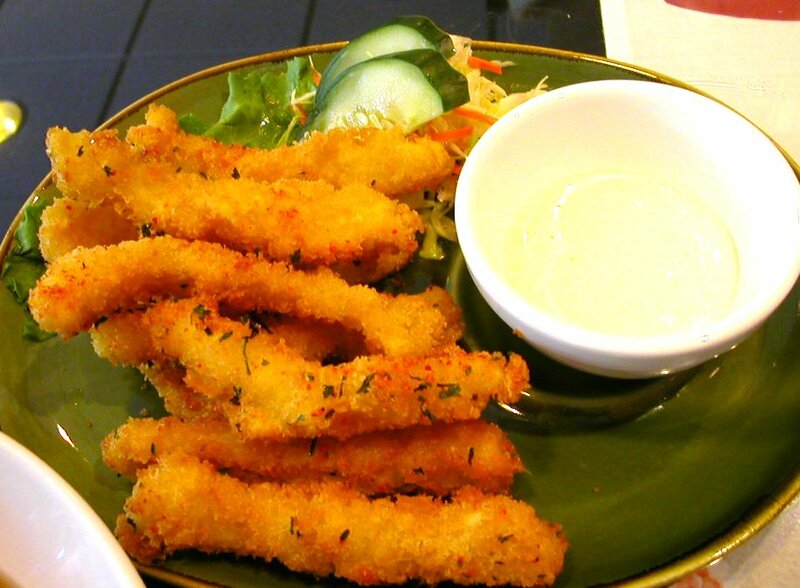 There are $4.50 choices like yakisoba with seafood, salmon teriyaki and Japanese calamari tempura; $3.50 choices like Age Dashi Tofu, Japanese egg roll, and salmon sushi; $2.50 choices like rice, edamame and green tea ice cream. 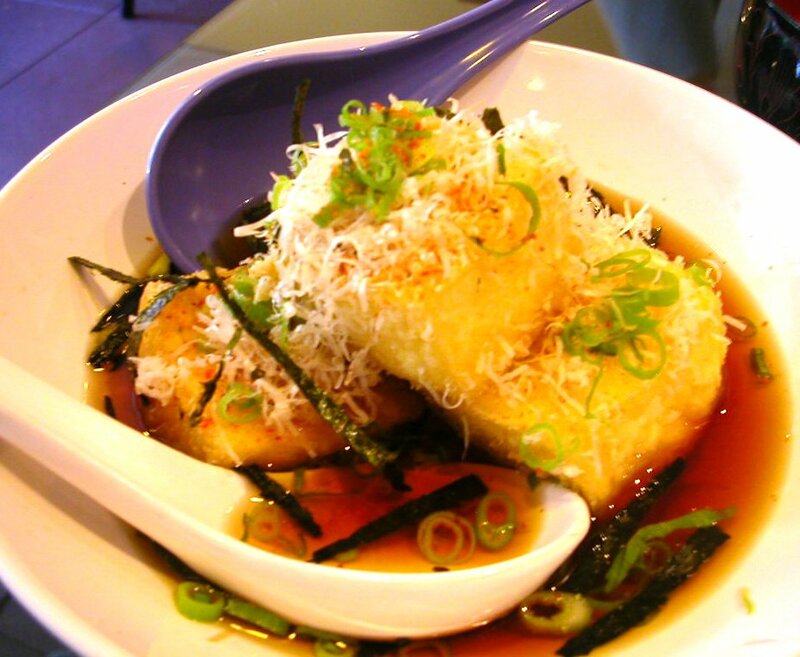 Order any two and you get a bowl of miso and a salad as well. 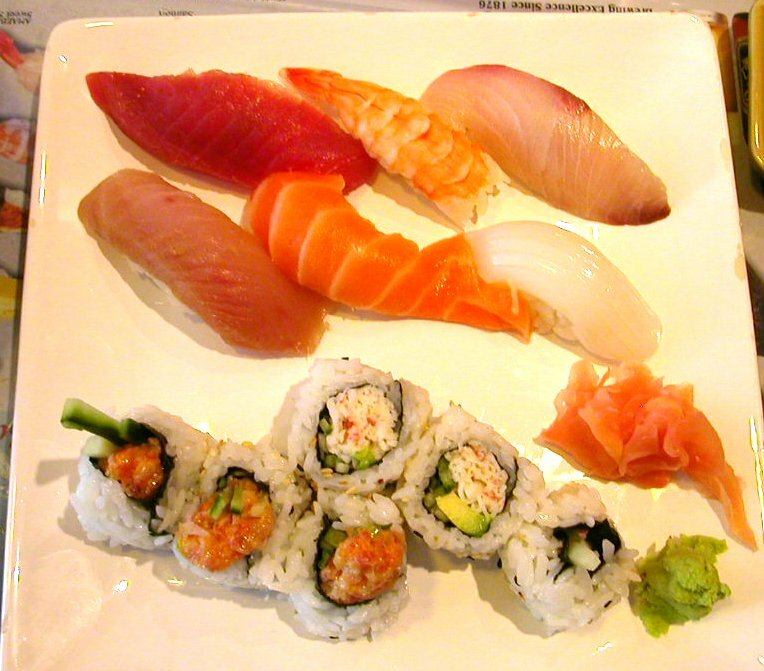 There's also an astonishingly good sushi bento box for $11 with six pieces of fish, half a tuna roll and half a California roll. Loved it! And I thought I knew all about dim sum. Gulp! One to cook, one to eat, right? At Tango, midway between downtown and Capitol Hill, the "cooker" is Michael Bruno. And the eaters are happy indeed. 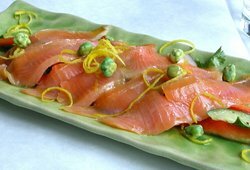 Take, for example, his smoked salmon ceviche: cured in salt, tequila and vanilla, served with onions, red peppers and wasabi beans. 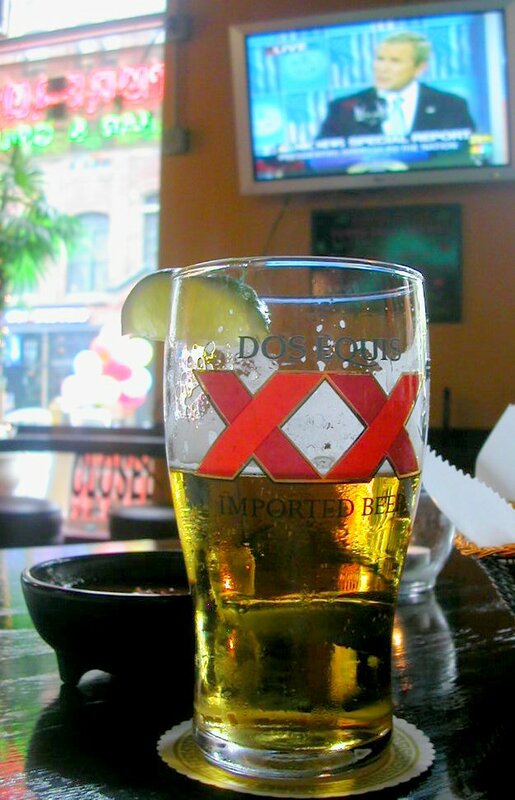 Normally $10, it's half-price during happy hour. Mojitos are also $5. 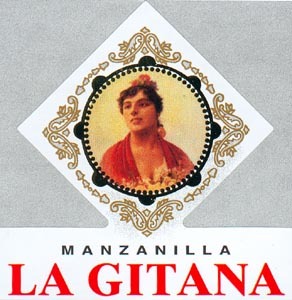 My fave, though, is the driest of dry sherries, a Hidalgo "La Gitana" Manzanilla, served in a huge shot glass, $6. It was supposed to be a ceviche tasting, so we sampled the crab & portobello mushroom [with basil and habanero aioli], the mixta [clams, mussels, calamari and baby octopus in a horseradish-cucumber vinaigrette], the Ecuadorian [shrimp and scallops with tomatoes, avocado, lime and chiles] and the surf-&-turf [sirloin carpaccio dressed with lobster oil]. 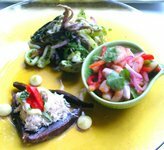 Ceviche is a catch-all for a style of South American "cooking" with citrus and other acids rather than heat, although sometimes there's a bit of poaching involved as well. And Chef Bruno isn't a purist about his recipes; he's inspired by the ceviche tradition, not just copying recipes. We're not done by a long shot. 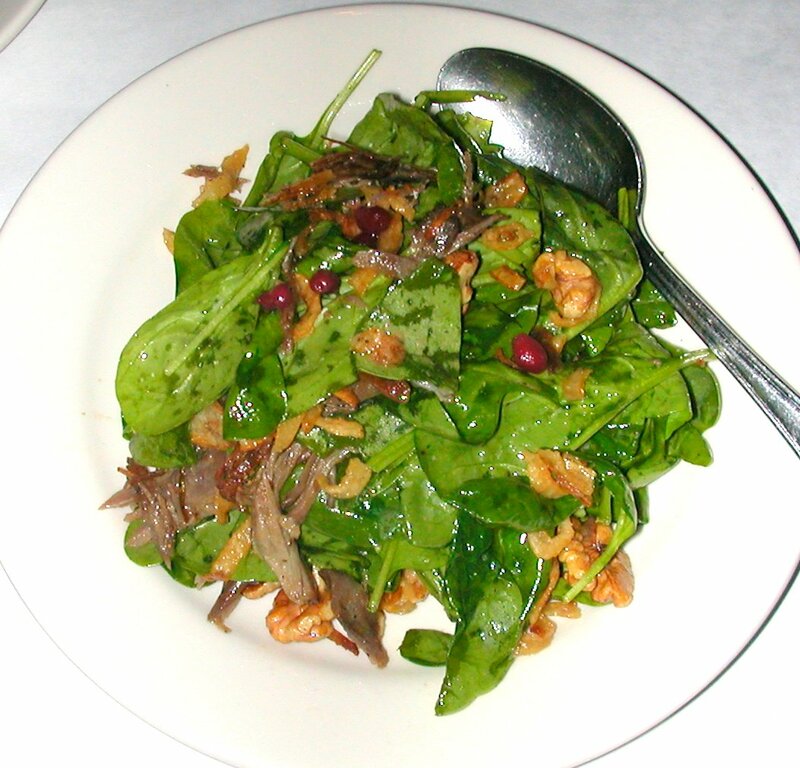 Gotta try the Cheap Date [madjool dates wrapped in bacon, drizzled with balsamic vinegar, plated on slices of roast eggplant] and the lush, lush duck confit with spinach, fried onions, walnuts and a pomegranate vinaigrette. 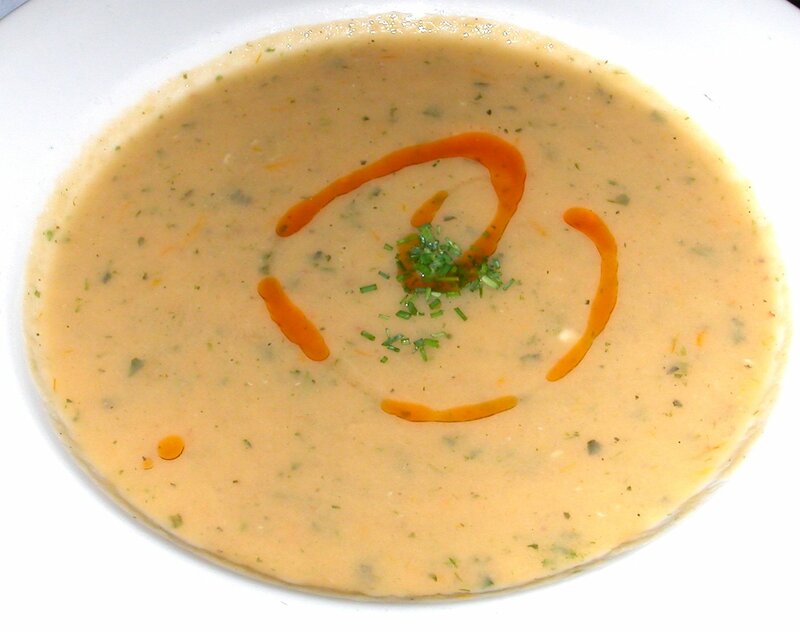 Bruno's ["everybody just calls me Bruno"] take on gazpacho was the happiest thing about our time at Tango: a tasty blend of yellow tomatoes, bright canteloupe and smoky roasted garlic, drizzled with a bit of ancho chile oil and sherried vinegar. Tango and its sibling, Bandoleone, are owned by Danielle Philippa. She sure knows how to run a restaurant: Tango's been around for almost ten years. Ellensburg's Amy Mumma, who runs the World Wine Program at Central Washington University, was named the world's top woman wine professional at the Wine Women Awards in Paris last week. 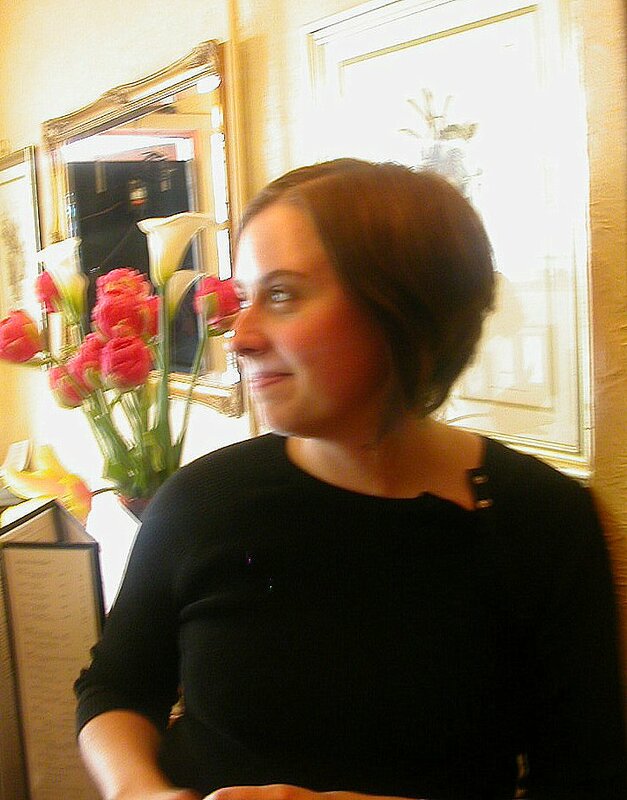 Amy has studied wine in Burgundy, earned an advanced certificate from the Wine & Spirits Education Trust and is currently studying for her Master of Wine diploma, the wine trade's most prestigious certification. The setting for the competition, which involved over 100 entrants, was the tony Hotel Bristol. And it's not the first time a Washingtonian has climbed the summit in Paris: back in the late 1980s, after a grueling competition at the Hotel Intercontinental, a young wine steward from Seattle named Larry Stone was named the world's best sommelier in French wine and spirits. Thanks to Andy Perdue of Wine Press Northwest for bringing this to our attention. 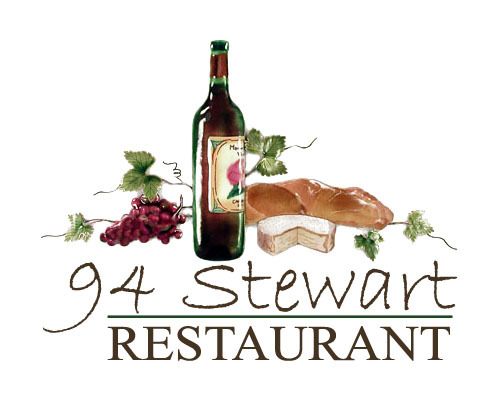 Today's hot tip is a bistro that resembles Le Pichet and shares its neighborhood: it's called 94 Stewart, which means you won't forget the address. If the space looks familiar from the outside, you might be thinking of the Garlic Tree. Get over it, and hurry on in. 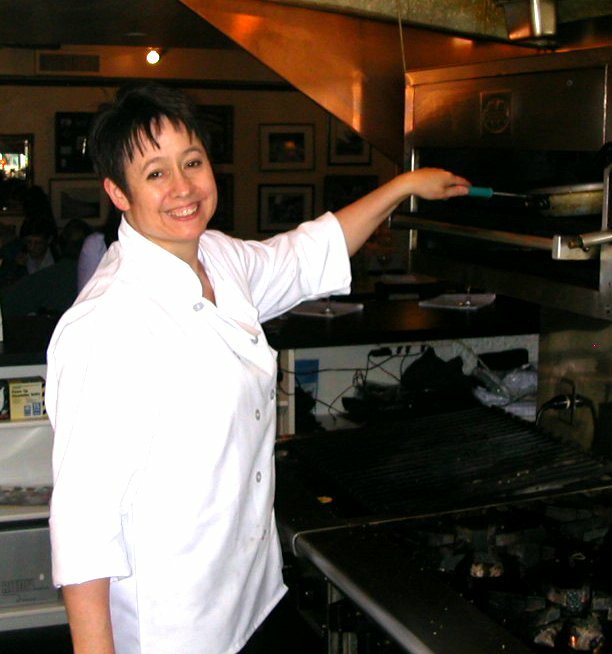 Cindy Norton, a newcomer to Seattle, is the chef, and she’s a fireball. At lunch, the crab focaccia ($12) has what we all crave: plenty of Dungeness crab, moistened with a basil aioli and drenched in cheddar. 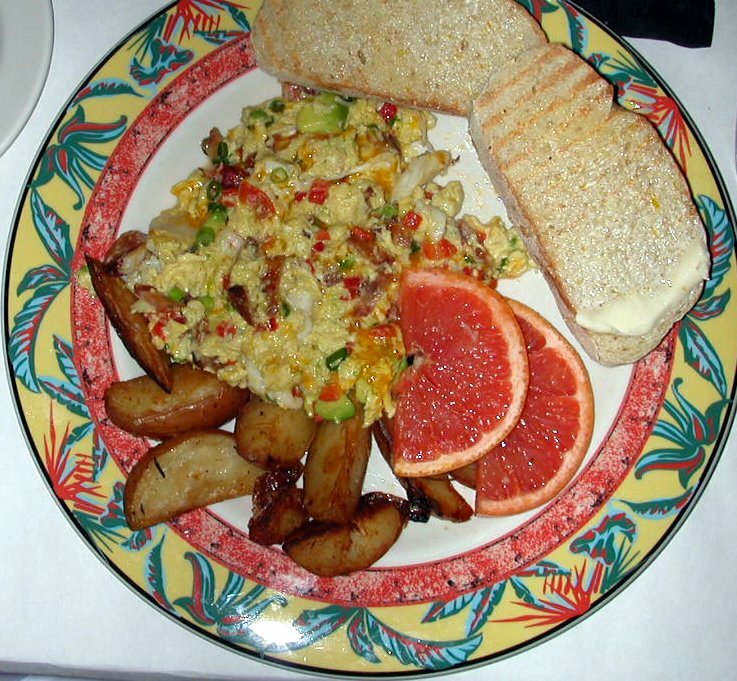 At brunch, there’s more crab in the Crabby Morning scramble ($14). Come for dinner and start with crab cakes ($14). 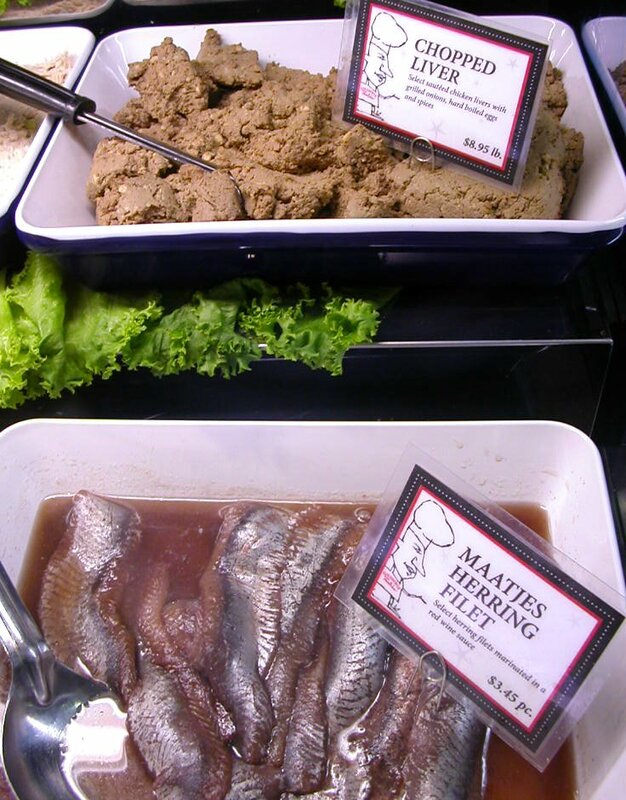 Yes, there’s more than crab. 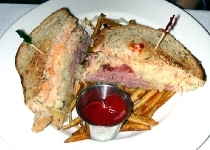 A terrific Reuben ($8—and better than the $12 Reuben at Goldberg’s Deli over in Factoria). A burger made with ground lamb. Roast lamb at dinner, too. Cindy’s daughter Lindsey is the wine steward, and she could teach most sommeliers a thing or two. Sunday is BYO night, no corkage. Tuesday is half-price wines. There’s a specific wine suggestion from the by-the-glass list for every dish on the menu, lunch and dinner. And if you need more libations, there’s a full bar as well. I'm not crazy about the desserts, but I don't have much of a sweet tooth. 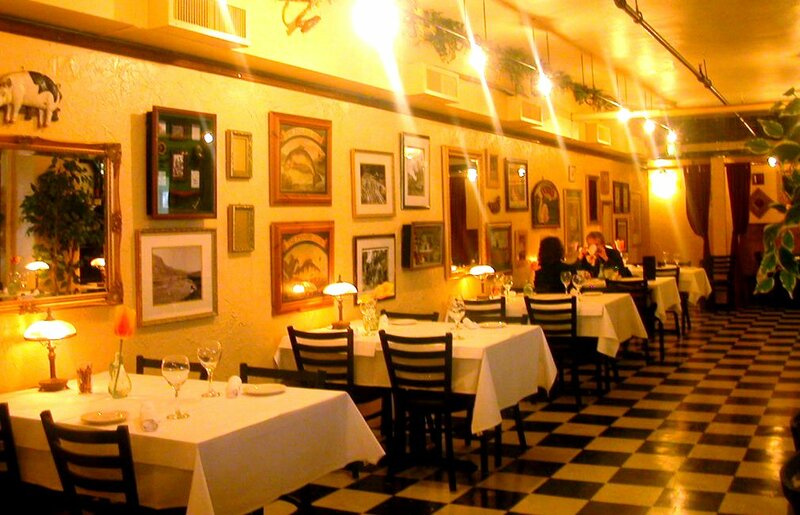 And if 94 Stewart isn't yet quite as cozy and steamy as Le Pichet, who cares! In the beginning, Le Pichet didn’t know what it wanted to be, either. UPDATE July 8th: read Nancy Leson's lukewarm review in today's Seattle Times. Oh dear. 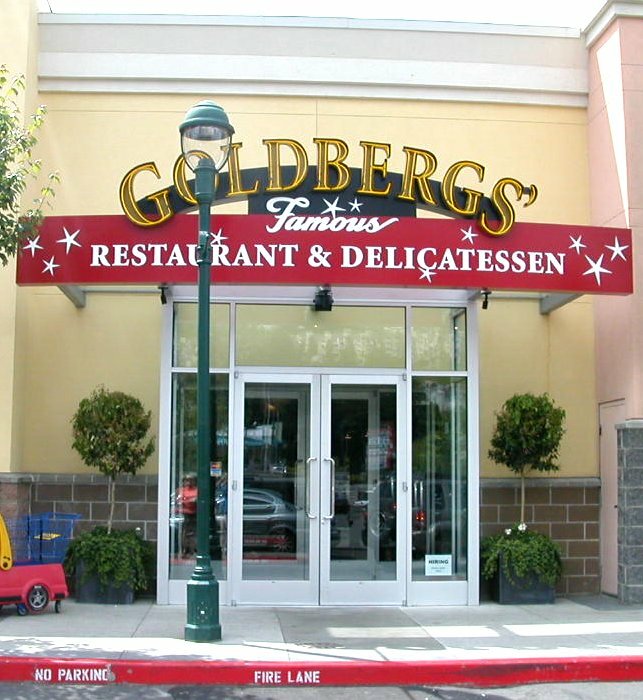 Rumblings of trouble from Factoria, grumblings of discontent, rumors of layoffs at Goldbergs, home of the $12 reuben sandwich. 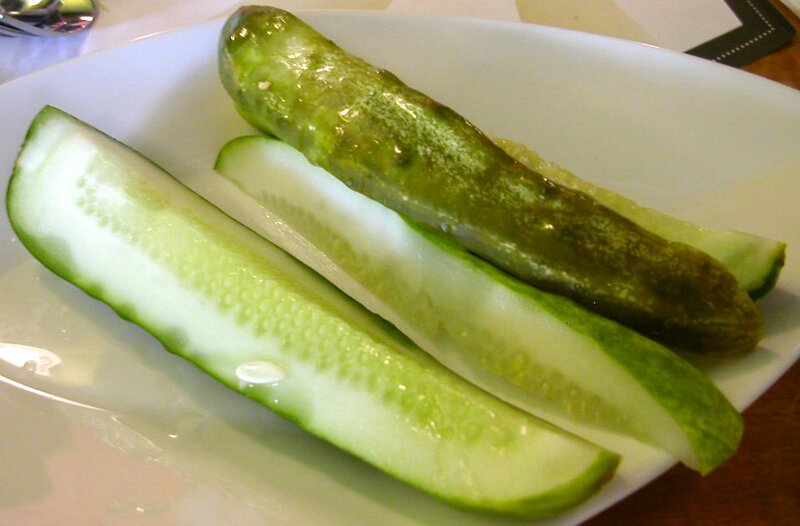 Pickles alone do not a deli make. Nor seedless rye imported from Detroit. Even if you have latkes, chopped liver, herring in cream and pickled tongue, it's not enough. Sure, ya gotta have attitude. But more than that, ya gotta have heart. 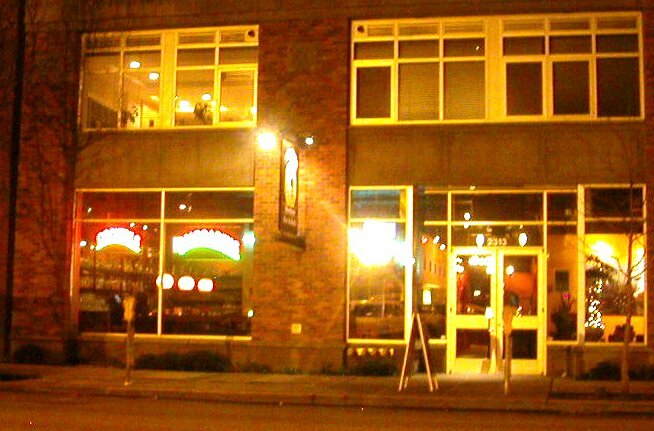 An epiphany of sorts this morning for the Seattle Post Intelligencer's snarky restaurant reviewer, Penelope Corcoran, always complaining about restaurants in Belltown because she can't find a place to park: people around here actually walk to restaurants. No limits to her bizarre tastes. 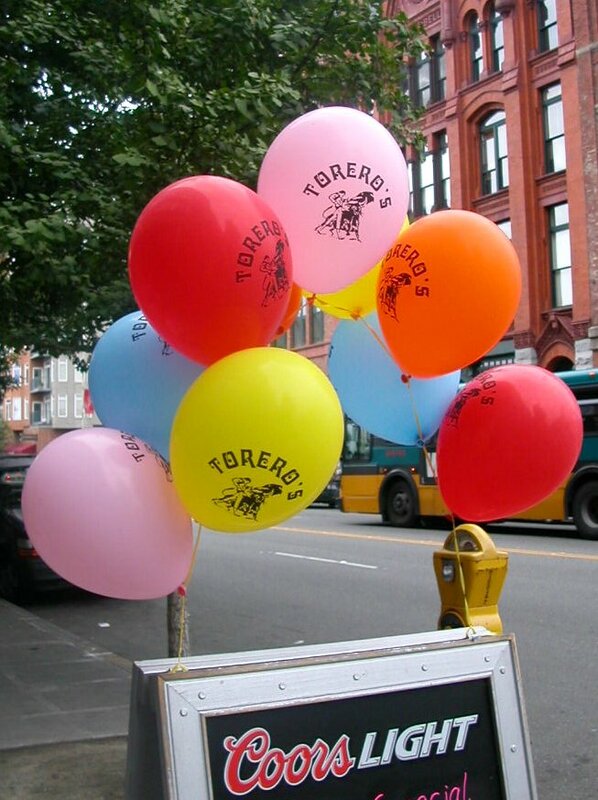 She actually liked Torero's. Why on earth she had to come to Belltown to review a restaurant that belongs in Renton, I'll never know. Not as far to drive, perhaps. I walk past the place regularly, rarely see anyone inside. Guess Penny got lucky. There's a revolution going on under the Big Top. Radical, alternative, underground: it's not your grandmother's circus anymore. It's not the big-budget Cirque du Soleil, which has become an entertainment empire; nor is it madcap dinner theater like Teatro Zinzanni. Instead, inspired by edgy performance artists like Jim Rose in the US and encouraged by the discipline of formal circus schools in Europe, there's a whole new generation of circus geeks and freaks. We have one such troupe here in Seattle: Circus Contraption. The company, a dozen or so musicians, jugglers, aerialists and comedians perform in a terrific space out at Magnuson Sand Point Park. Co-founded in 1998 by Lara Paxton [a terrific dancer and trapeze artist] and Armitage Shanks [a larger-than-life, louder-than-needed onstage persona], the group is currently presenting a wacky evening titled "Grand American Traveling Dime Museum," with songs and skits based on exhibits from old-time sideshows and penny arcades. I could carp about an unimaginative lyric here, a missed light cue there, but that would miss the point. These guys are in the vanguard, out on the lunative popcorn fringe of live theater, and they perform to enthusiastic crowds. The real shame is that half the seats in this supposedly theater-crazy town were empty last night. Circus Contraption's good enough to have nailed down a gig in New York this fall, where they're sure to be a hit. They're doing three shows a weekthrough July at Sand Point. Go see them before they leave. No kidding. www.circuscontraption.com. PS: A new book called Freaks & Fire devotes an entire chapter to Circus Contraption. Outside reviews: Seattle Times, Seattle P-I, The Stranger. Sampled Reuben sandwiches at two locations in the past week. First at Goldberg's, a new "authentic" Detroit-style deli at Factoria Mall. Following day at 94 Stewart, a new place in the Pike Place Market. 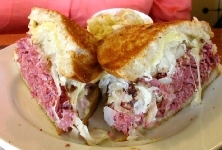 A small cup of unexceptional potato salad accompanied Goldbergs' $11.95 sandwich, which was stuffed with corned beef flown in from Detroit and a wad of sauerkraut on bland, lightly toasted rye bread; but it lacked dressing. Delicious sweet-potato fries came with the $7.95 Reuben at 94 Stewart, whose sauerkraut was slathered with Russian dressing and topped with gruyere, all between slices of crunchy, grilled onion rye. So why would anybody pay an extra four bucks just to eat at a mega-deli in a mega-mall? 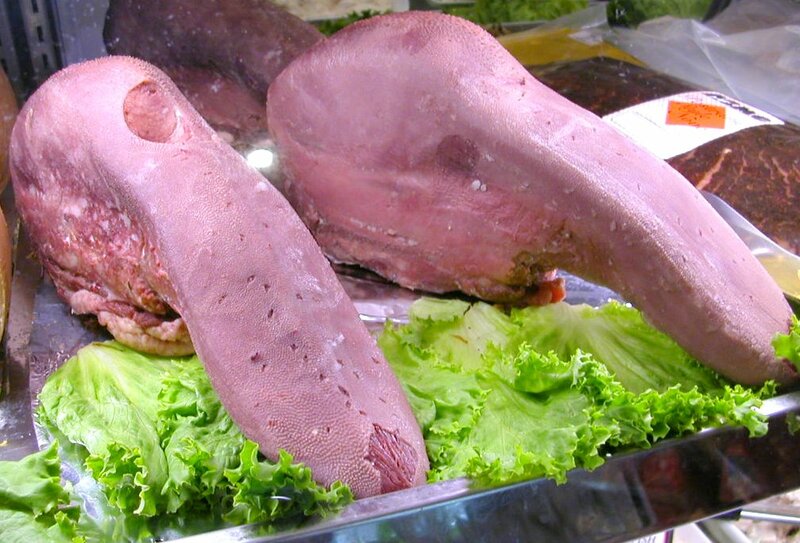 Granted, Goldberg's offers 100 different sandwiches, including my favorite, pickled tongue. And it's multi-cultural: on my visit, the maitre d' was Chinese, the waiter Mexican. But it also seemed to represent typical suburban overkill. More about the real find of the week, 94 Stewart, in my next post. It's not a huge region, but it's growing fast: Paso Robles covers 40 square miles, 25,000 acres of vineyards and close to 100 wineries. For the first time, 32 of the region's producers are on a four-city tour--New Orleans, Chicago, Denver, Seattle--to show off their wines and raise the region's profile. 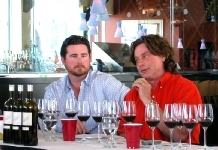 The Seattle tasting, at Waterfront Seafood Grill on Pier 70, began with a seminar led by winemakers Stephan Asseo, in the red shirt, and Austin Hope on the diversity of the Paso Robles AVA: over 50 varieties planted [though almost half the acreage is cabernet sauvignon], soils that range from calcareous to sandy loam to clay, rainfall that varies from 6 to 60 inches, and day-night temperature swings of up to 50 degrees. 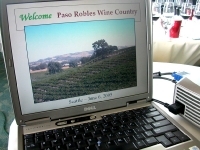 The region's greatest contribution may be its idiosyncratic "Paso Robles" blends: a syrah-cabernet from Asseo's l'Aventure winery reminded me of Domaine de Trevallon, while his grenache-mourvedre-syrah blend was mainstream Chateauneuf-du-Pape. Asseo's a classically trained French winemaker, by the way, who grew frustrated by AOC regulations in Bordeaux and settled in Paso Robles just seven years ago. "I didn't want to make another Bordeaux," he said. "I left Bordeaux to make something else." Straddling Highway 101 midway between Los Angeles and San Francisco, the region welcomes visitors with festivals in spring, a harvest wine tour in October, even a three-day wine university. It was old home week for the executive director of the PRVGA, Stacie Jacob. 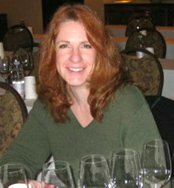 Until six months ago, she was communications director for the Washington Wine Commission, so she has plenty of experience developing PR for newer wine-growing regions. And all four of the Paso tastings were produced by local sommelier David LeClaire, whose company, Wine Events & Promotions, is increasingly active outside of Seattle. The dining room has the best view in Belltown, from corner windows five stories above Alaskan Way. 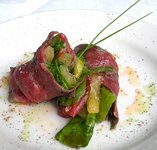 The best prices, too: salads and appetizers for about $5, main dishes for $7.50, fine wines for $3 a glass, $15 a bottle. And the servers are forbidden to accept gratuities. It's called the Portfolio Dining Room, the public face of the Art Institute of Seattle's two-year program in culinary arts. 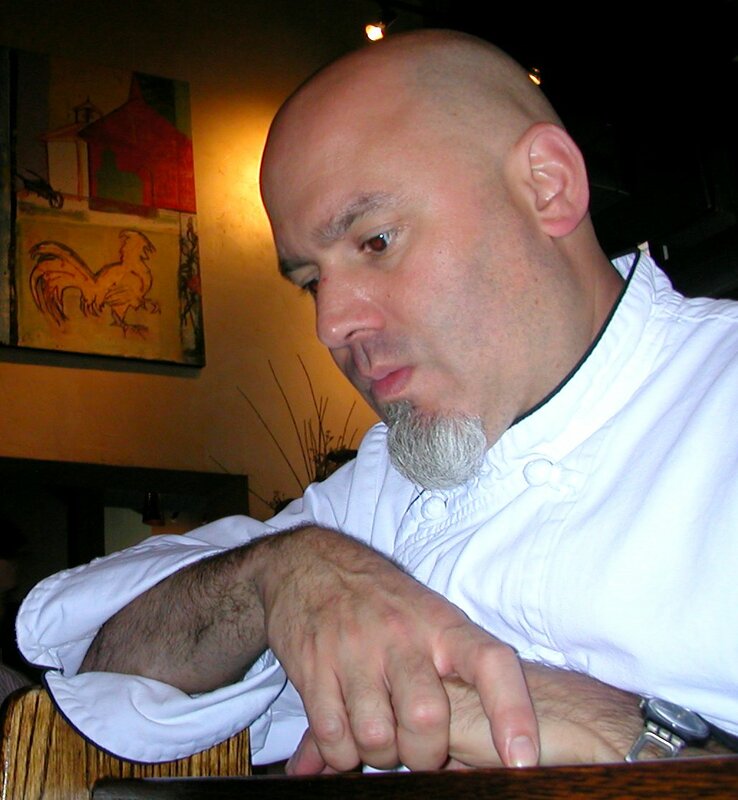 Chef-instructor David Wynne, a veteran of the Culinary Institute of America and local kitchens like Roy's, Brasa and The Ruins, oversees a group of two dozen 6th-quarter students who rotate between dining room and kitchen stations at lunch and dinner. Wine guru Dieter Shafer keeps an eye on service details. I was delighted by the mezze plate of hummus, fromage blanc, tapenade, lentils, peppers and marinated beans, accompanied by freshly baked pita. Dieter brought out a bottle of earthy Erath pinot noir from Oregon that matched the meal perfectly. Then came a fragrant dish of cherrystone clams cooked with sausage and tomatoes. Best part of the meal was an exquisitely tender chicken tagine with an apricot-flavored couscous. A perfect Mediterranean lunch. Chef Wynne gets a new class every 11 weeks; the students approach each station with enthusiasm . Trouble is, the schedule keeps changing! 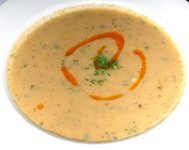 In the best of times, Portfolio is open Wednesday, Thursday and Friday for lunch (11:30 to 1) and dinner (6 to 7:30). But it's lunch only during summer quarter, which lasts from July 19th to September 15th. Best bet: call 206-239-2363 to be sure of a reservation. You won't be disappointed.